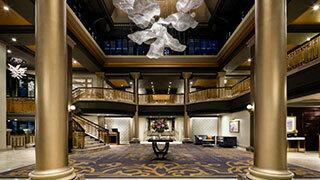 The stunning new lobby at the Fairmont Empress. The Q restaurant and bar. Named in honour of Queen Victoria, the iconic Victoria, BC hotel Fairmont Empress will celebrate its official ‘Grand Opening’ on 28JUN following a $60 million restoration. Recently unveiled to guests, the restoration's final phase showcases a renovated health club and pool, refreshed Willow Stream Spa with an expanded lounge, updated reception and revitalized retail area; and 229 updated guest rooms. Gracing the exterior of the building is the porte cochere, was constructed to provide a sense of welcome prior to entering the spectacular new reception lobby. The showstopper is the "Twill Flower" -- a six-meter high floral-shaped chandelier. Hand woven with approximately 250,000 crystals the sculpture pays homage to Victoria's reputation as the City of Gardens. "We've taken a landmark building and restored the original architectural elements with modern, elegant touches. 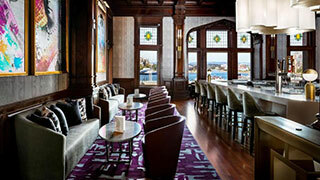 It's a fairy tale transformation and a milestone for this beautiful castle," said Fairmont Empress GM Indu Brarr. "And, we're ready for the world to see it." Fairmont Empress opened in 1908 and lured world travellers to the then far-flung destination of Vancouver Island. Over the years, the hotel has hosted luminaries including Winston Churchill, Bob Hope, and members of the Royal Family. In 2014, Vancouver developer and philanthropist Nat Bosa and his wife, Flora, purchased the hotel and commenced the two-phase renovation shortly thereafter. "When Flora and I bought the hotel, we had a vision of restoring this Grand Old Lady to her former glory. True to my words at the time, this old mistress has given me some headaches, has cost me one hell of a lot of money, but is now beginning to bring us some pleasure," said Nat Bosa.